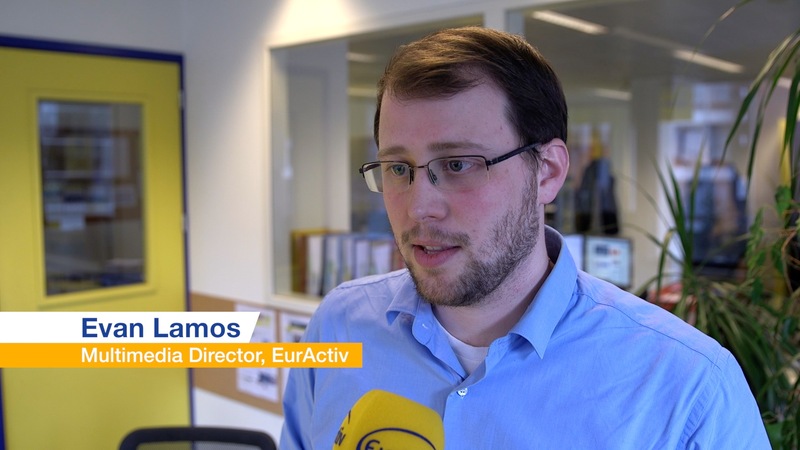 euractiv.com’s own Evan Lamos was on the scene, travelling on the metro to work at our offices opposite the European Commission building, when he heard the blast at Maelbeek metro station. The 30-year old father was between Art-Loi and Maelbeek at 9.11am, when the terrorists struck. Five minutes earlier, he would have been caught in the explosion. “We felt a blast of hot air and heard a thudding sound. It sounded like thunder in the distance. The metro immediately stopped, the power went off and the engine stalled,” Evan, who has a one-year-old daughter, said. After about two to three minutes, officers opened up the backdoor of his carriage, the last one on the train, and put a ladder against the back of it. “There was one person who was jumping over seats to get out of the back of the carriage but apart from him, people evacuated calmly. There wasn’t panic. Lamos, a US citizen who has lived in Belgium for 15 years, helped one woman, who was with her child, with her stroller as they walked back to Arts-Loi through the dark tunnel. Lamos took video footage as he walked back to Art-Loi – footage which has since been picked up by media across the world. They were quickly shepherded away from Arts-Loi station by police and soldiers. “There was already a sense of nervousness and tension on the metro because we had heard about the explosions at the airport. People had been checking their phones,” he said. 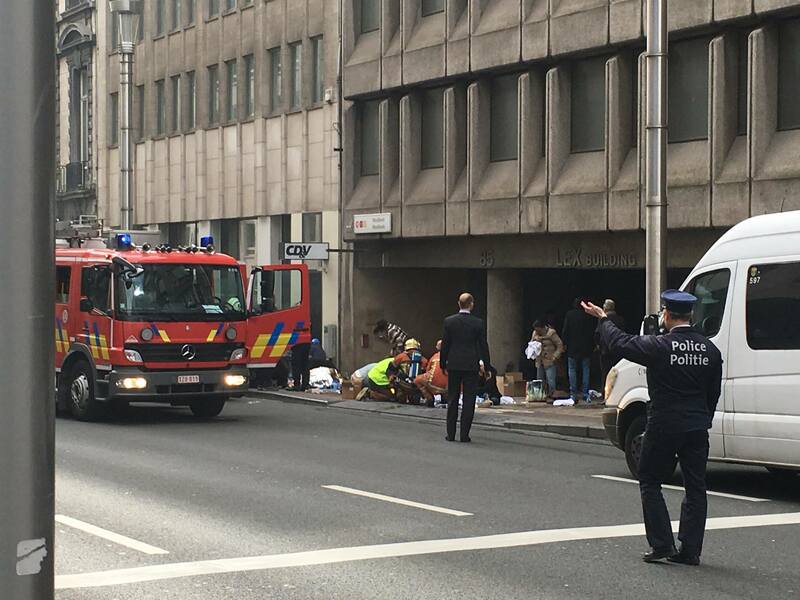 Our colleague Evan Lamos was in the metro between Arts-Loi and Maelbeek stations this morning when the explosion happened. 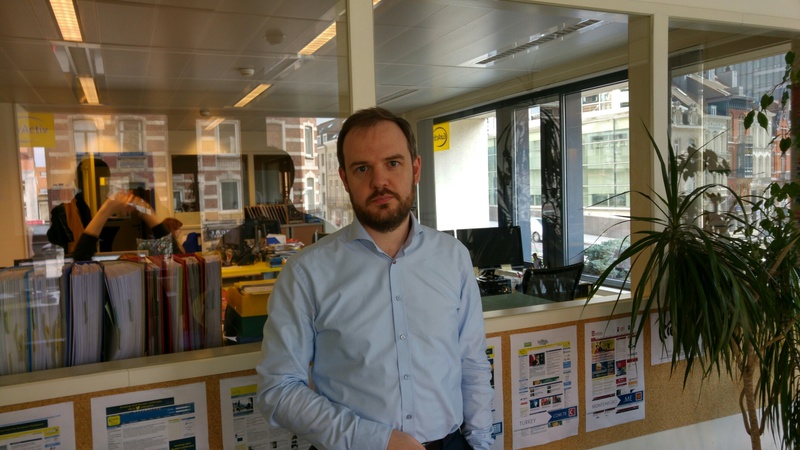 Lachlan Carmichael is a journalist with Agence-France Presse who has lived in Brussels for two years. He was on the metro between Arts-Loi and Maelbeek as well. “We were pulling out of Arts-Loi station, we’d gone maybe 100 metres or so, when we felt this whoosh, like a shockwave,” he said. The train came to a stop and a recorded message in French, Flemish and English, said there were technical difficulties on the line. “The first thing I said to the guy next to me was ‘did you hear there was an attack at their airport?’” he said. “Then the smoke started to come through into the carriage,” said Lachlan, 56, a dad of two daughters. Carmichael, who is half Scottish and American, said the smoke got gradually thicker and thicker. As Carmichael walked back to Arts-Loi the smoke became thicker and thicker. “It began catching in my throat,” he said. “I asked a woman next to me if she was scared – no one seemed to be panicking – she said yes. I told her she didn’t look like it. “Believe me, she said, on the inside I am terrified’” After about 200 metres, the journalist – who has covered wars in Iraq, Kuwait and Afghanistan – saw soldiers at the Arts-Loi platform. They evacuated him and his fellow passengers. Carmichael went down to the scene and was confronted with the horror of the attack outside Maelbeek station. The 37-year-old Belgian lives with his girlfriend in the centre of Brussels. He has lived in Brussels for 14 years. Parc metro is near the Belgian government buildings. Ostyn saw ambulances and police cars with armed cops. He decided to continue down to his office, which took him straight past the Maelbeek metro station. “I could smell smoke and then I could see smoke coming out of the three or four exits to the Maelbeek metro station,” he said. “There were victims lying on the ground. There were people injured and people in shock. You could see that they had gold or silver tinfoil wrapped around their shoulders. Ostyn watched as cordons went up and police evacuated the area before carrying onto his workplace, which is opposite the European Commission building. Casualties could have been worse at the Maelbeek metro station, had it not been for many EU officials taking time off for the Easter break. The metro line is a major thoroughfare for employees commuting to work at the EU institutions. But the Commission has an extended Easter break, beginning on Thursday and finishing on Tuesday. Many officials take this week off to turn the break into a week. However, this could mean that some officials were at Brussels airport when the terrorists first struck. 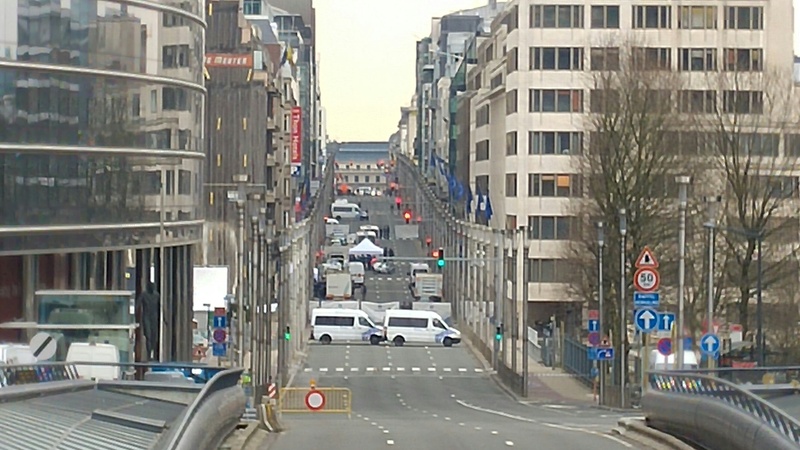 As of mid-afternoon in Brussels, it was still unclear whether any officials had been killed in the blast. But the institutions were ringing around their staff – a process made more difficult by the Easter break – to see if anyone is missing. A European Commission official, speaking on condition of anonymity, said that the atmosphere in the Berlaymont building was “confused and shocked”. “These people are indiscriminate. We’ve seen it in other countries such as Spain and the UK that have suffered terrorism. It doesn’t matter where they do this, it will have a major impact. “The thing with Brussels is that if you explode a bomb anywhere, you will kill people from countries all over Europe,” he added angrily. Gary Cartwright, 54, used to work in EU institutions but is now a consultant in the private sector. He has lived in Brussels for almost 12 years. “In the mornings Maelbeek is real rush hour. The station is packed. Trains are coming through every couple of minutes. The trains are so full at rush hour you can’t get on them,” the veteran of three tours of military service in Northern Ireland said. Most schools in Brussels are yet on Easter holidays, it should be noted. Cartwright was at home when the first explosions happened but still walked in. Then the second explosions at the nearby Maelbeek station happened. The former British Army serviceman had tried to reach friends and colleagues but the mobile networks in the European Union quarter were down. “I did three tours in Northern Ireland when I was in the Armed Forces. I’ve seen things like this happen close-up but I thought this was in the past,” he added. Cartwright is thinking about leaving Brussels but not because of today’s attacks. “It’s very important when you look at these kind of people, that you don’t let them make your decision for you. At the local EXKI café on Rue Froissart, in the heart of the European quarter of Brussels, the eight-strong team of staff had been told they couldn’t leave. They had begun work at 6:30AM as usual but, after the explosions at the nearby Maelbeek metro station, found themselves in the centre of the police cordon. They continued to serve their normal clientele of EU officials as the drama unfolded. One young waitress, who asked not to be named, said that the workers were scared when they heard about the first blast at Brussels International Airport. They became more scared when they heard the second blast. “It’s not good that we can’t leave. We have to continue working, we have no choice,” the waitress said. 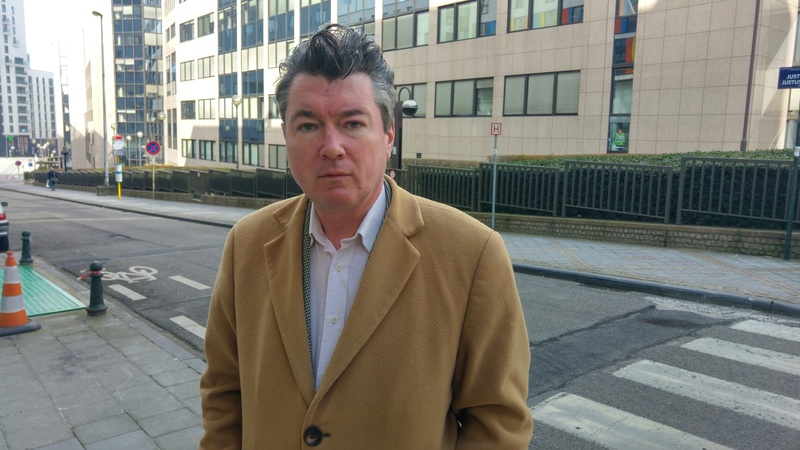 Dafydd ab Iago, 47, is a Welsh journalist living in Brussels. He recently took Belgian citizenship. He lives in the capital with his Spanish girlfriend and two children, aged three and nine. He has not taken the metro for two years because he feared just the kind of terrorist attack that happened today. iago smelt the smoke and saw one man with his face heavily bandaged near to the metro station. The European Parliament was in lockdown, with soldiers and security stationed outside. Metal guards had been lowered in front of its front doors. There was a heavy police and army presence in the region. At one moment, six police vans drove up to the area, followed by two police cars. In the passenger seat, there was an officer wearing a balaclava and toting a machine gun through the open window. The EU institutions were a tempting target because of all the different nationalities that work there, said Iago. Iago was worried about his children. At the time of the last lockdown in Brussels, he and other families were kept waiting at school to pick up their children. Some schools even had snipers on their roofs. “I won’t be surprised if they close the schools tomorrow,” he said. “We were meant to go to the airport to fly to Spain on Monday but I don’t know if that will happen now,” he added. The bomb was reported to have gone off in the departures lounge, near a Starbucks café and the American Airlines registration desk. Asked if he was considering leaving Brussels, Iago said the same thing could have happened in London. “I really think the only way to fight this is by finding a Europe-wide solution,” he added. Andreas Gahleitner is 33, and an Austrian. 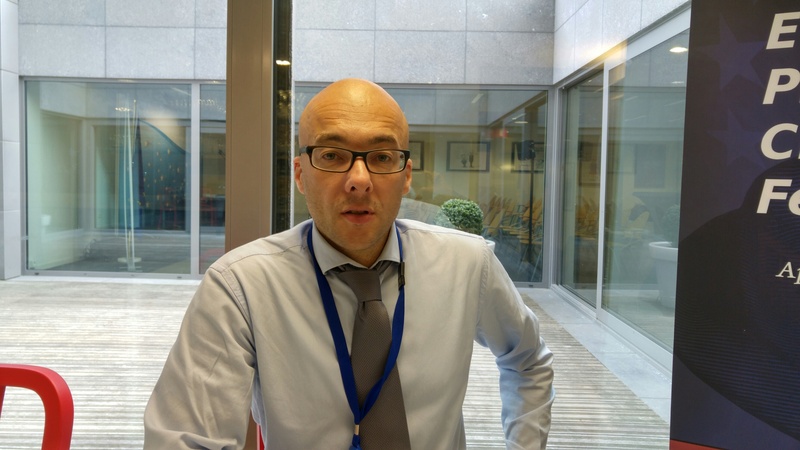 He has lived in Brussels for three years, and works for the European Aluminium Association. Normally he would have been at Maelbeek when the bombs went off – but not today. He said, “I’m physically unharmed, but I am not OK. Maelbeek metro station at 9am, that’s me. Every day, except today. Andreas said he had received many concerned messages from family and friends. “Ankara, Paris, Istanbul, I have friends there and I hoped I would never have to answer the kind of messages I had to send to them in the past,” he said. And this after Abdeslam succesfully hid there for months, obviously protected by a network of friends and sympathizers. There is a cancer growing in Brussels and it needs to be cut out.